I was at a violin shop one day to get my violin fixed. There was a wall of all kinds of postings for private lessons for all sorts of instruments. I decided to take a card from a married couple named Kevin Kwan Loucks and Iryna Krechkovsky who taught piano and violin. I never followed through to call them for private lessons but after several months, I somehow bumped into them online. 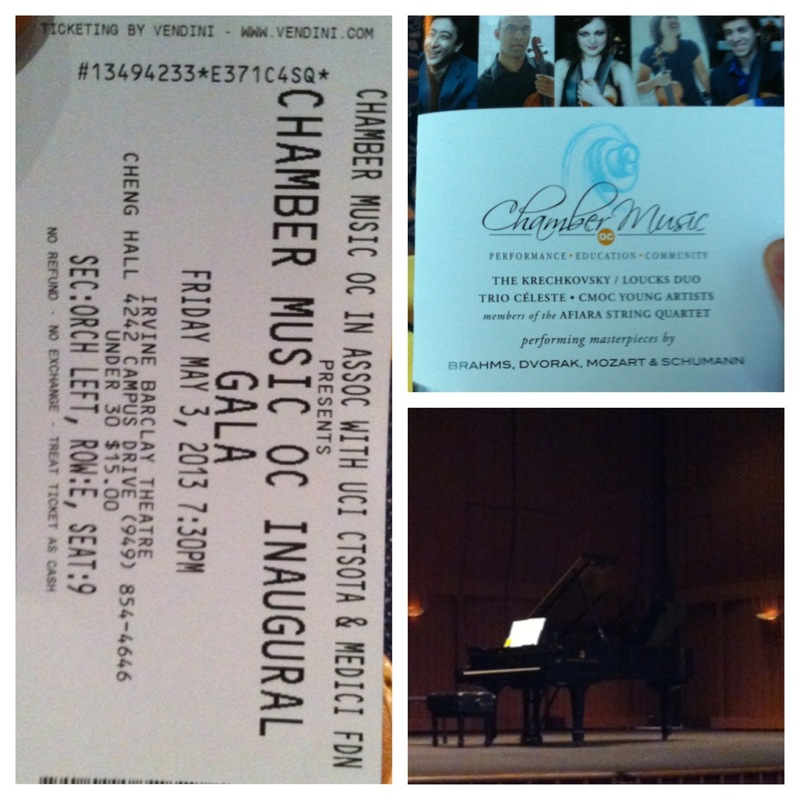 I found out that they were performing in Irvine as head organizers of the Chamber Music of Orange County! So I had to attend their performance knowing that they’re a big deal. At the Irvine Barclay Theater, the Chamber Music of Orange County performed masterpieces by Brahms, Dvorak, Mozart, & Schumann. Students as young as middle school to adults performed various pieces that were thoroughly entertaining. The show started with a great opening piece by Johannes Brahms called Sonatensatz. There was a lot of energy throughout this whole piece. I really enjoyed it when the musicians would repeat the deep bass parts together. It wasn’t too dark of a song where it felt haunted. I experienced more of an enlightening emotion during this performance. I felt as if someone was going through some kind of struggle and they had to push through it. It sounded like there were some repeats or similar melodies or rhythms in the music. The similar repeated parts made me think that whoever was going through struggles went through emotions that went up and down where they wanted to give up or persevere. The way the piece ended sounded like the person was able to overcome their battle. Another classical piece that was performed was a Piano Quartet-First movement in G minor by Mozart. The emotion of the music seemed pretty consistent where it felt mysterious but exciting. During the mysterious parts, I felt as if it was a gloomy moment where an argument was taking place between a mother and her daughter. During the heavy bass parts, it sounded like the mother was mainly lecturing her daughter. When there were some light joyful moments mainly coming from the piano, it seemed as if the mother and daughter were coming into some kind of mutual agreement. The end sounded as if the mother won the argument though. I could go on and on with all of their pieces but that may just bore you. Those were a few of the pieces that stood out to me the most. They were all breathtaking and really brought me into a different world of emotions. Listening to these pieces again on YouTube makes me excited to watch them perform again.